This year the Critter Adventures in the Fairelands advanced to the next logical level: fashion blogging. You can’t blame Petal, those are some fancy things to wear! There are strange creatures swimming in the depths of OtherWorld. Creatures born as colourful as the world around them, camouflaged within the plants, breathing in same bubbles of magic as the plants fluttering within the currents. They form symbiotic relationships with other creatures, embraces of friendship and support, each lending strength to another in ways the other does not possess. They do not garden, they nurture. For them life flows in one stream that each brings something unique to, for them there is no separation of self from the world, for them they are all one. For them all is life. If you have not yet visited Fantasy Faire, it’s high time! If you happen to be a mer-creature, I warmly recommend the seas of OtherWorld for you. The difference between falling and flying is very small and for a great amount of time non-existent. Perhaps the biggest difference lies in faith, in trust. Perhaps if you truly believe you can fly, your fall will become a flight. Perhaps it teaches you to feel for others struggling to fly, for either their environment chaining them earthbound or their fear locking them down. Perhaps it lights the warmth of empathy, of recognition, kindles your fingertips with mercy and encouragement. Maybe the fall will cease to frighten you if you stop staring down, stop estimating the distance to ground, to the moment when your shivering reflection meets your helpless form. Maybe if you look up instead, at the endless skies, endless opportunities, the fear will let go and loosen its grip. Perhaps in that moment of being embraced by the open sky you finally realize you had wings all along. 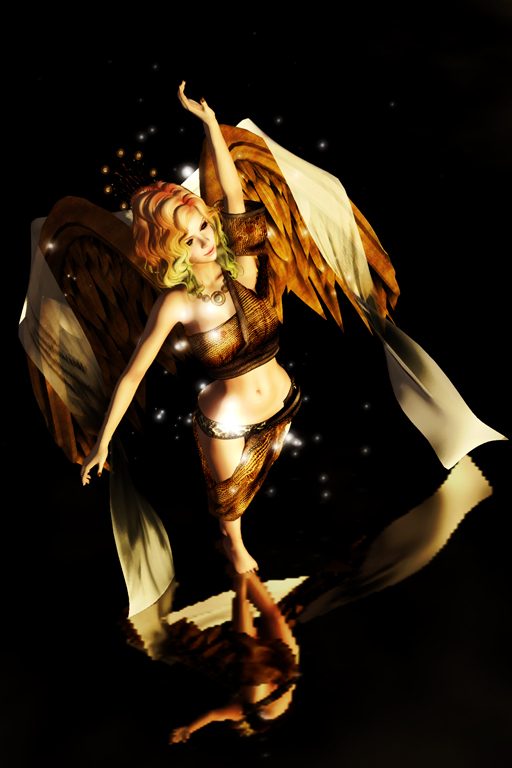 The absolutely stunning wings by ClaVv are an exclusive prize in The Epiphany, meaning you can purchase them with the points you’ve redeemed from the gacha prizes you got from the event. You can read how the system works on their website. The outfit by !gO! is from the current round of The Secret Affair. Summer was always too short. The time to return took her by surprise every year despite the signs beginning to appear: her skin paled, her hair lost its vibrant colour, the summer greens changed to darker winter tones. The butterflies transformed to small spirits, twirling around her, eager to return back to Hades. Flower decorations became chains and bones, metals and gemstones. The blooming lines across her body sharpened into a strong mask befitting the Queen of the Underworld, the one whose name was barely whispered aloud in fear it would call her attention. Call the attention of the one carrying into effect the curses of men upon the souls of the dead. As the nature quiets into its winter hibernation, Persephone returns to Hades: the realm and the god. She returns and she rules by his side until the awakening spring calls her back to the warmth of summer. The dress by Fallen Gods Inc. & [FAIDA] is one of the exclusives in The Epiphany. You can acquire the exclusives by redeeming in your gacha prizes, that way you can get rid of the commons you don’t want and get exclusive shinies in return! The halo by Cerberus Xing is a gacha prize in the same event. 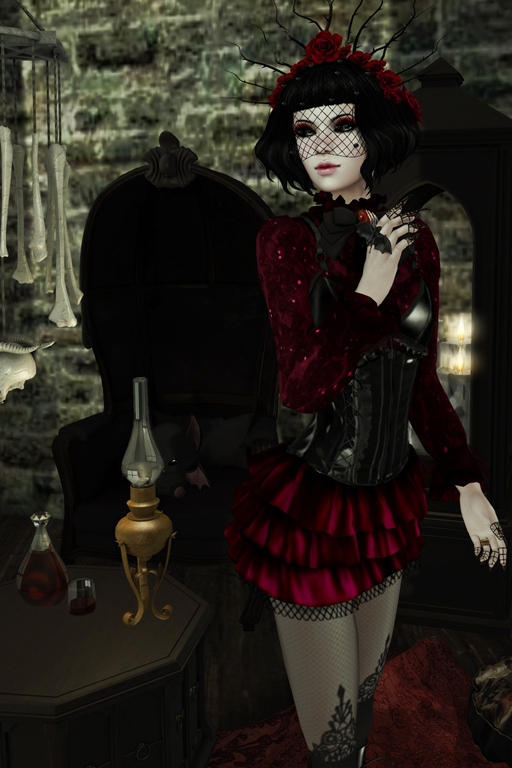 The tattoo by Fallen Gods Inc. is available in Create Your Own Tarot event, the skin by Fallen Gods Inc. is from Wayward Carnival, the hair by EMO-tions from Hair Fair and the necklace by !deviousMind from the current Underworld round of Genre. The sound of the bones is soothing. They clatter gently in the evening breeze, each touch a hollow sound, echoing into the night. They know things, the bones. The older they are, the more they know. Secrets long forgotten, secrets taken to the grave, secrets buried deeper than the graves ever were. If you listen well, if you can hear with more than your ears, you can catch their whispers, the faded words, the forgotten languages. If you listen to the silences between the hollow sounds you will understand. Understand and be able to ask questions. Ask, answer and to have whole quiet conversations within the dead echos of the worlds; ours and all the others. You can find the outfit by Livid, bow tie and nail ornaments by Bliensen + MaiTai, poses by [Black Tulip], eyes by Pin Me Down and the furniture by 22769 ~ [bauwerk], *NeverWish* and Chaos Panic & Disorder all from World Goth Fair.